This prestigious pet friendly Santa Fe home is perfect for large groups and extended stays. A very spacious 4,200 sq. ft. home with first class amenities is located in the gated community of Tesuque Hills just a few miles north of the Plaza in Santa Fe, the capital of New Mexico. This large, two story custom home offers 4 Bedrooms with 3/12 Baths and gives a rural setting but is just minutes away from the renowned Santa Fe Opera and the Village of Tesuque. The grand entry invites you to step into four private and large bedrooms. The Master suite offers a king bed, fireplace and luxurious bath. In addition there is another suite with full private bath. The two additional bedrooms offer a double bed and your preference for a king or twin beds. There is another full bath in the hall for these two bedrooms to share. As you wonder upstairs your eyes will feast on the wonderful architecture as you enter the second level. The formal living room with fireplace and views is complete with a Baby Grand Piano. The dining room is open to this space as well. The state of the art kitchen is complete with Bosch stainless steel appliances, built in desk and breakfast nook. In addition to the main living area, is an additional TV room with fireplace where you can enjoy the large, flat screen TV. Casa de Paz is filled with beautiful art and a professional and custom decor to simply relax and enjoy your stay in our beautiful City. There are two decks off the living area and kitchen to enjoy an out door meal on the BBQ. Two car garage is available for you convenience. 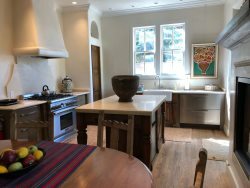 This large vacation rental is perfect for your family getaway to Santa Fe! "Live like a local, it's the next best thing to living here!" Minimum night stay must be approved by Manager for online bookings. During peak season, minimum night stay on most properties is seven (7) nights. Please see our seasons under the Rates tab above. We are not able to accommodate arrivals on major holidays (Christmas, Easter, Thanksgiving) During the Christmas and New Year’s Season, certain arrival dates may be implemented. Casa de Paz is a peaceful, tranquil home away from home. The furnishings and original art work suit the ambiance of the Southwest experience. It is very comfortable and the kitchen is very well equipped. Visiting the opera and then having a "baby grand piano" to play on was wonderful. Sitting on the portals after visiting the museums etc. was very relaxing. We go back every year, staying in this wonderful home. Adobe Destinations by Proctor Property Management, Inc.